The oxygen demand of a water sample is the amount of elemental oxygen required to react with oxidizable or biodegradable material, dissolved or suspended in the sample. This amount is expressed as milligrams of oxygen per liter of sample. When the agent required to effect the oxidation reaction is a population of bacteria, the oxygen required is called BOD. When the oxidation is carried out with a chemical oxidizing reagent such as potassium dichromate, the oxygen equivalent is called the COD. Other means also effect the oxidation of material in a water sample, including heating the sample in a furnace in the presence of oxygen, TOD, or in the presence of carbon dioxide, resulting in a total carbon dioxide demand (TCO2D) measurement. The BOD test is the most important oxygen demand measurement for analyzing effluents and receiving waters (streams, lakes, and rivers). The BOD test measures the amount of oxygen used by microorganisms feeding on organic water pollutants under aerobic conditions. In this test, a bacterial culture is added to the sample under well-defined conditions, and oxygen utilization is measured. Although test procedures are carefully defined, obtaining reproducible results is difficult and the procedure is subject to the influence of many variables, particularly when the wastewater contains a variety of complex materials. When the incubation time and temperature are not stated, the general assumption is that the test was run at 20°C for a period of 5 days. For example, in Figure 7.8.10, the BOD test result can be stated as BOD5 =100 mg/l. 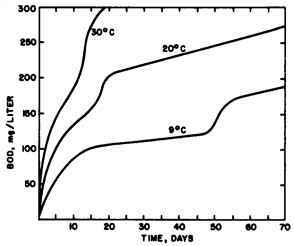 Figure 7.8.10 also shows that bacteria first consume carbonaceous material, and only when the carbonaceous materials are all oxidized (around the 15th day) are nitrogenous material consumed. FIG. 7.8.10 Progress of BOD at 9°, 20°, and 30°C (48, 68, and 86°F). The break in each curve corresponds to the onset of nitrification. cedure. This laboratory procedure requires some skill and training to obtain concordant results. In the procedure, the environmental engineer mixes a measured sample portion to be analyzed with seeded dilution water so that after 5 days of incubation, the DO in the mixture is still sufficient for biological oxidation of the material in the sample. Of course, this portion cannot be known beforehand; consequently, the environmental engineer must run several dilutions simultaneously for an unknown sample, or use experience as a guide for well-defined samples. Seeded dilution water contains a phosphate buffer (including ammonium chloride), magnesium sulfate, calcium chloride, and ferric chloride, as well as a portion of seeding material. The former group of inorganic materials is frequently referred to as nutrients. 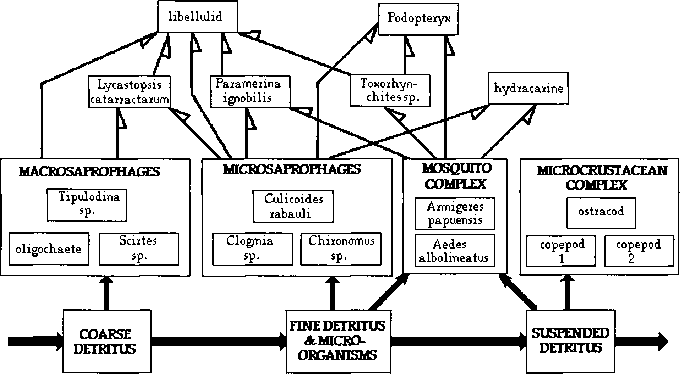 The latter group is a suspension of bacteria in water, usually supernatant liquor from a domestic sewage plant. Seeds can also be prepared from soil, developed from cultures in the laboratory, or obtained from receiving water 2 to 5 mi downstream of the discharge. The environmental engineer determines the DO content of the mixture at the start of the test and again after 5 days of incubation at 20°C in a special BOD bottle. The DO can be determined by the Winkler titration method or instru-mentally with a DO membrane electrode. The difference in DO after 5 days is used to calculate the BOD of the original sample. 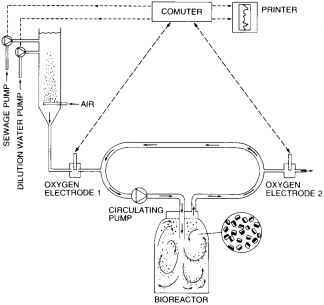 Corrections must be applied for the immediate oxygen demand (due to inorganic reducing materials) and for the oxygen required by the bacteria for sustaining life (endogenous metabolism). No standard exists for measuring the accuracy of the BOD test. The precision of the method is also difficult to ascertain because of the many variables. However, environmental engineers have tested the single-operator precision of the method using a standard glucose-glutamic acid solution. Using eight types of seed materials, they found the single-operator precision to be 11 mg/l at a level of 223 mg/l, or about 5%. These results were obtained with highly skilled personnel under well-controlled laboratory conditions. A semiautomatic instrument can measure the BOD of as many as eleven samples. The samples must be manually placed on the instrument turntable, and the controls must be manually set. The instrument provides for the automatic reaeration of samples in which the DO has fallen to low values. The polarographic DO sensor measures the DO on a preset time schedule. The automatic reaeration capability for low DO eliminates the need for dilution, leading to improved precision in BOD results. The instrument consists of a measuring unit (DO probe, aerator, water-sealing mechanism, unplugging mechanism, sample bottle, and turntable) and a control unit by which all operations are programmed. The measuring unit is housed in a chamber maintained at 20°C. The instrument can store DO data on each sample and calculate the BOD from the DO values as just described. In the standard dilution method, all oxygen required must be inside the BOD bottle since it is sealed in a gas-tight manner at the initiation of the incubation period and air can not enter the sample. In the manometric procedure, the seeded sample is confined in a closed system that includes an appreciable amount of air. As the oxygen in the water is depleted, it is replenished by the gas phase. A potassium hydroxide absorber within the system removes any gaseous carbon dioxide generated by bacterial action. The oxygen removed from the air phase causes a drop in pressure that is measured by a manometer. This drop is then related to sample BOD. The manometric method lends itself to automatic recording of oxygen utilization since the pressure can be monitored continuously. This monitoring is accomplished in a commercially available automatic respirometer (see Figure 7.8.11). 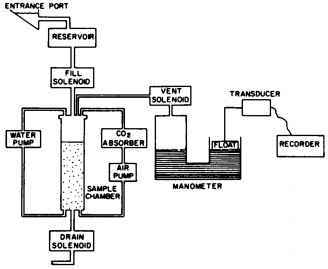 The manometric method introduces the sample, from 1 to 4 liters, into a closed system containing air. The countercurrent circulation of both air and water in the system insures equilibrium between the dissolved and gaseous oxygen. The system provides a carbon dioxide scrubber in the gas-circulation line. A recording manometer detects the utilization of oxygen, and the test is run for several hours. Published data indicate a correlation between 4-hr respirometer BOD and standard BOD. Laboratory and automatic online versions of this instrument are also available. BOD measurement is inherently a time-consuming process and ill-suited to the requirements of process monitoring or control. The shortest period for the automatic respirometer is 2 hr, much too long for an effective control instrument. However, it is an excellent device for laboratory studies since it can simulate the activated sludge process. When BOD concentration is determined in groundwater, waiting 5 days for the results may be acceptable. However, in the control and operation of sewage treatment plants, it is not. The hold-up capacity of industrial and municipal wastewater treatment facilities and the need for closed-loop control necessitates faster sensors. Figure 7.8.12 shows such an analyzer. FIG. 7.8.11 BOD determination by an automatic respirometer. FIG. 7.8.12 BOD assessment in a continuously circulated bioreactor where the oxygen take-up of the organisms controls dilution. luted sewage enters and leaves the reactor. The DO concentration at electrode 2 is kept at a constant value below that at electrode 1. If this difference drops, the bioreactor increases the sewage concentration; if this difference rises, it reduces the concentration. The sewage concentration in the bioreactor (the nutrient concentration) is adjusted by a computer that varies sewage mixing ratio and dilution water. The total flow from the sewage and dilution water pumps is always 1 l/min, and the ratio of the two streams is modulated. Therefore, this pumping ratio indicates sewage sample BOD concentration. Environmental engineers have found the correlation between this fast BOD measurement and the 5-day BOD obtained through conventional methods acceptable. Pipe fouling was minimal, and weekly recali-bration of oxygen electrodes was satisfactory.